Here's another in my ongoing series of reviews of travel tripods. You can find the other reviews here. Oben's CT-3581 is a carbon fiber travel tripod. Like many others in the current generation of travel tripods, its legs fold back on itself to create a small package for packing. 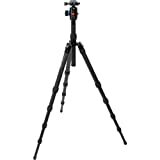 With twist-locks to extend the legs, parts that convert to create a monopod, a load capacity of around 26 pounds, and an included small ballhead tripod, it shares similarities with several of its competitors. The legs are in 5 sections and they extend with standard twist locks. The locks work well enough, although the sections don't glide into each other as smoothly as they do on some other tripods. That makes me suspicious that they might be more prone than usual to grit locking them up, but I haven't actually had that happen. The legs fold out into three splayed angles, with the ratchet system at the shoulders being spring loaded, so you don't need to manually lock it into place. I prefer the spring-loaded ones like this to reduce the risk of planting it with one of the locks not being fully secured. When fully extended, the legs bring the camera to about eye level even without extending the center column. That is, without the center column raised, the legs alone raise the camera to around 60 inches. Once you add the center column, it makes for one of the taller of the travel tripods, reaching up to about 68 inches.. I try to minimize using the center column anyway simply to maximize stability, and I found that I could safely remove and detach the center column, thereby saving a little weight, while the legs remained plenty tall enough for most of my needs. The legs were quite stiff with very little flex even in the thinnest, lowest sections of the legs. Again, if I don't need the extra height offered by the lowest sections I'll often leave those retracted and shoot from the slightly lower perspective so as to maximize stability. The feet don't come off--well, not really--but they have built-in retractable steel spikes. When fully retracted, they're rubber feet. Twist them, and spikes protrude. Some other tripods use this system as well, but I'm not much of a fan of it because when retracted there's a recess that mud and dirt can get stuck in. But it is also possible to pull the rubber feet off completely and leave just the exposed steel spikes. Unusually for a model like this, none of the legs has a foam grip--usually at least one leg does. That's not exactly a big deal, but having at least one leg with a foam grip can be appreciated when carrying or moving the tripod with cold or wet hands or when wearing gloves. It comes with an Oben BE-126T ballhead. It's locked with two knobs, a small one to lock rotation and a larger one that clamps down on the ball. Both work well and smoothly and have adequate grippiness for the fingers, although I did find that the larger knob that controls the ballhead itself needed a lot more turning to really lock on compared to many other ballheads. It also comes with an Arca Swiss-style quick release plate. There's a small bubble level on the base plate and, in an unusual little feature, the knob that clamps down on the quick release plate also has its own bubble level, which I guess might come in handy when shooting in portrait orientation. And, of course, if you prefer a different tripod head you can remove the included one and swap it out for your preferred one with a standard 3/8" stud (although the tripod is only available, to my knowledge, as a legs+head package). The center column is reversible, so you can turn it over to get very low-angle shots if you prefer. And it's also removable by splitting the center column (using a small allen key to unlock the top part of it). That way you can splay the legs wide and shoot very low to the ground without the center column limiting how low you can get. There's a hook on the bottom of the column that you can attach a counterweight to to add stability. I found that the legs by themselves were tall enough to bring it up to an eye-level shooting height for me. Extending the center column brings it up quite high, but I also found that full extended there was a bit of give even when the twist lock was firmly locked in place. That's certainly something that could be improved. One of the legs detaches to form the base of a monopod. You then slide the center column out (unscrewing the spring clip and plate at its base first) and attach the two parts together. It comes with a somewhat padded soft case (with shoulder strap) and a couple of small allen keys for make adjustments and splitting the center column. Overall, the Oben CT-3581 is a no-frills, workman-like travel tripod. The convertible monopod is really the only notable "extra feature," but overall its features and build-quality are good without being remarkable. It is taller than many of its competitors, which is something worth noting. With a standard DSLR rig, I found it quite stable. Of course, with a lightweight travel tripod like this you have to be realistic about its strength, but I found it to be no less stable than its competitors even with larger combinations like a Nikon D810 and a Nikon 80-400mm zoom telephoto. So long as it was properly tightened, the ballhead locked it firmly in place even in portrait orientation. That said, I do have some concerns about the build quality and materials. I have not found any problems with the one I've been using; I also having been using it long-term. But others have reported inconsistent quality control issues, and I can see some potential problem areas. The spring-loaded ratchet locks at the top of each leg to control the angle is both too light and a bit flimsy. The fit for the leg sections is also not as smooth as it could (or should) be and seems a prime candidate for jamming if grit gets in there. And when fully extended the center column is not as rock-solid as I'd like. But if the Oben CT-3581 lacks some of the whizz-bang elements or refinement of its direct competitors, that's also reflected in the very reasonable pricepoint. The MSRP is $349, but I've seen it up to $100 under that. And at that price, it's at least $100 less expensive than its nearest direct rivals. That makes it a value proposition worth looking at if you're working with a limited budget. But if you can't find it for less than the $349 MSRP, I find it hard to recommend the Oben over something like the MeFOTO Globetrotter, which is very close on features and price. You can find them at B&H Photo and Amazon. can u ship it intrnational? I'm not a retailer and don't sell or ship any products, but many of the big retailers like B&H Photo, Adorama, or Amazon can usually ship internationally.